Growth up to 2½ft. Tube and sepals creamy flesh pink, corolla deep magenta. Short jointed and generous flowers, very good for berries. Growth 2½ - 3 ft. Tube and sepals creamy white, corolla bright magenta. Tube and sepals magenta, corolla fully spherical shape, matures bright white. Medium sized blooms, tube cream veined red, sepals white tipped with green, corolla violet fading to lavender. Tube and sepals white, fully recurved, corolla opens to violet, white at base, maturing to light violet. Tube and sepals creamy pink, corolla violet pink. A good variety for show. Profuse flowering self coloured soft pink blooms. Tube rose pink, sepals rose pink with white undersides, corolla white flare, short anthers. Small but generous flowers. Very large blooms quite freely produced considering their size. Tube white, sepals white with rose bengal base, corolla white, best produced in a shady position. Early flowering variety, pale orange self-colour. Reliable grower flowering on branch tips, salmon pink self-colour, foliage pale green and slightly rough textured for additional interest. Horizontal stiff growth suitable for baskets (with careful pinching), or ground cover. Chiefly grown for its attractive foliage, young leaves are green and yellow maturing to dark red and salmon. Tube and sepals scarlet, corolla purple, very late flowering. Large clusters of self coloured salmon slender tubed blooms carried on branch ends. Foliage bronzy green. Strong upward growth, tube and sepals deep cerise, corolla white flushed pale pink. Pinkish salmon self-colour with olive green foliage. Tube and sepals deep pink, corolla violet. Short jointed and strong with spreading growth. Trailing or ground cover species, tube yellowish green, red at base and very short, sepals chocolate brown, no corolla. Foliage very small dark green. Flowers held erect, very large berries maturing to plum purple. 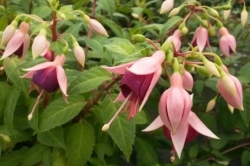 Species Fuchsia : Very small flowers held erect in large panicles. Tube and sepals rosy purple, corolla lavender. Foliage shiny green with pale undersides and red veining. We only sell well established young plants of excellent quality, grown from our own cuttings and from exactly the same stock as we use ourselves for growing on into larger plants at the nursery. We are therefore happy to guarantee our plants for 14 days from the date of dispatch, or purchase at a show. If you are not completely happy with the plants please contact us within 14 days and we will provide either replacement or refund at our discretion. Return postage (if applicable should the plants be required to be returned) will also be refunded. Please note if the nursery is not contacted within the 14 day guarantee period we cannot entertain claims. After this time failure of the plants will be due to the growing conditions, which are beyond our control and for which we cannot be held responsible.